Free parking spaces in Mill Valley. Image from the city of Mill Valley. Free parking has, over the last decade, been identified as a major cause of sprawl, tax wastage, and traffic. San Francisco’s pioneering SFPark program, which attempts to price parking according to demand, has found that a well-managed parking supply can decrease traffic, increase retail sales, and even increase the availability of spaces. Downtown Mill Valley is running an opposite experiment of sorts with 30 of its downtown parking spaces. PG&E will be replacing a significant amount of pipe downtown for weeks, taking 8 spaces out of commission and causing major disruptions to the usually bucolic town center. To counteract that, Mill Valley has made 30 spaces – a hefty fraction of its on-street parking – free from April 14 to May 2. I’m sure you’ve had the misfortune of circling endlessly for a parking space, only to have the one you spotted snatched up by someone in front of you. Research from UCLA’s Donald Shoup has found that such circling accounts for up to 30 percent of traffic (PDF) in dense areas. This is a problem. The more time people spend hunting for a parking space (average is around 3 minutes), the less time they’ll want to spend at local shops. And, the more painful the search for a space, the less likely people will want to come back. The culprit is underpriced parking. 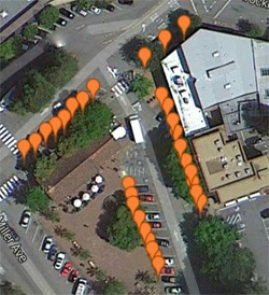 When SFPark started operating, the aim was to leave at least one space available on every block by adjusting the price of parking. SFPark measured occupancy by each block and raised or lowered prices incrementally one space was free per block. After three years, SFPark has decreased traffic, increased turnover, and – for the most part – accomplished its aims. The number of parking tickets has dropped and even the average price to park fell. This validates Shoup’s theories in a major real-world setting. The 30 spaces Mill Valley has made free are funded by PG&E and the local Chamber of Commerce, as the city relies on the income from parking meters for its general operations. Though there was apparently some talk about reducing bus fare to downtown, Chamber officials told The Greater Marin that PG&E didn’t give them enough of a heads-up to coordinate with another agency, and they’d rather do half of something – give free parking – rather than do nothing at all. Unfortunately, Mill Valley isn’t using this as an opportunity for research. Because only a few of the parking spaces will be free, those will be at a premium. Will it cause more circling in the free area? Will it decrease turnover? While the Christmas seasons’ free parking offers a great experiment for the whole downtown, it would be incredibly useful to understand how setting the price of parking at $0 for only a few spaces would affect downtown demand. It would also show whether this sort of program is a useful incentive to shop downtown or if it’s just going to muck things up more. Given the research on parking policy, it seems unlikely the two-week program will lead to anything like the efficiency downtown Mill Valley will need with PG&E’s construction. I suspect there will be people circling around for the free parking spaces and lower turnover than normal, though without data we’ll have no idea whether that’s true or not. It seems rather more likely that the program’s advertising aims – to let potential customers know that yes, indeed, Mill Valley is still open for business – will be the big win. The Chamber of Commerce will gather anecdotal evidence from its member merchants about what worked and what didn’t, and we’ll have to see what can be gleaned from that when the program ends. In the meantime, be sure to take Route 17 downtown. They could use the business, and I suspect they’ll also need the parking spaces.